The Southern California Behavioral Response Study (SOCAL-BRS) is an interdisciplinary research collaboration designed to understand the basic behavior (diving, acoustic, social behavior) of various marine mammal species in southern California, as well as their behavioral responses to controlled sound exposures. Its overall objective is to provide a more robust scientific basis for understanding the potential risk of Navy active sonar operations on marine life to better inform the planning, mitigation, and regulation of these operations. SOCAL BRS is a research collaboration (planned for 2010–2015) funded by several US Navy entities (CNO N45 Environmental Readiness Division and Office of Naval Research) in partnership with the US National Oceanic and Atmospheric Administration. Within this larger context of the SOCAL-BRS, we are also interested in understanding the context of behavioral responses. Specifically, we are interested in understanding how the foraging behavior and prey environment mediate the response of cetaceans to sound disturbance. In order to understand this, we first require a better understanding of how these animals forage and the decisions they make with respect to prey distribution and abundance. From here, we can measure how the behavioral response of whales is affected by sound once we have accounted for prey availability. performance as a function of oxygen use and prey patch density and depth. At low prey densities, feeding rates and energy intake per dive were low corresponding to minimized oxygen use, but at higher prey densities whales exhibited increased feeding frequency corresponding to maximized energy intake and increased foraging efficiency. Contrary to previous paradigms, we demonstrate that blue whales are not indiscriminate grazers but instead switch foraging strategies in response to variation in prey density and depth to maximize energetic efficiency. In combination with anatomical specializations to enhance engulfment and filtration capacity, these foraging strategies support the energetic demands of the largest vertebrates. Behavioral response studies provide significant insights into the nature, magnitude, and consequences of changes in animal behavior. Controlled exposure experiments (CEEs) to study behavioral response have faced challenges in quantifying the importance and interaction of individual variability, exposure conditions, and environmental covariates. 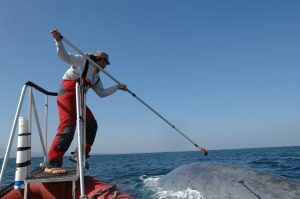 To investigate these complex parameters relative to blue whale behavior, we deployed multi-sensor acoustic tags and conducted CEEs with simulated mid-frequency active sonars (MFAS) and pseudo-random noise (PRN) stimuli, while collecting quantitative prey measures. In contrast to previous methods, we found a five-fold increase in explanatory power for detecting responses to mid-frequency sounds (r2 = 0.14 vs 0.725), emphasizing that deep feeding blue whales respond significantly to CEEs even after accounting for prey density and distribution. 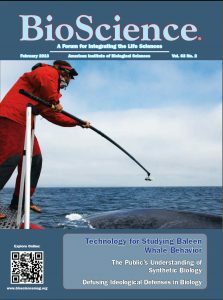 This reflects a vastly greater ability to characterize behavioral variability and empirically strengthen previous findings that deep-feeding blue whales respond significantly to CEEs with mid-frequency sounds. This dramatic improvement to explain individual response variability by including the environmental variables driving foraging behavior (prey) underscores the importance of empirically integrating all parameters in experimental designs. Understanding the interactions between environmental forces and anthropogenic disturbance is a critical advancement to reduce disturbance, especially for sustained or broadly distributed activities, across taxonomic groups.